Along with a constantly increasing crude oil price pressure, and a rising awareness of energy-saving and environmental protection, Light Emitting Diode (LED), as a solid-state lighting source, driven by the constant increase of its luminous efficacy and cost reduction, with the advantages such as small size, easy integration with system design, good color rendering, Light Emitting Diode (LED) has been substantially applied in the display industry, consumer electronics applications, and the automotive industry. 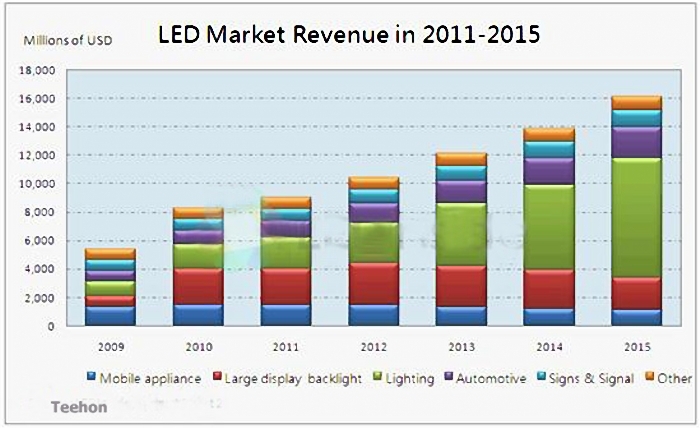 Besides, the LED penetration rate has been gradually increasing year by year. Especially in the lighting industry, LED lights have been actively introduced. The great topic worth deep discussion by the whole LED lights industry is how to develop a safe, humanized, and life-based product and how to promote LED to another wider application area by combining LED lights source and the end application. For all players in the LED industry, entering the Chinese market has become a solid trend that everyone cannot be withstood, as China will become not only the largest LED lights production area in the world, but also the largest domestic market. Therefore, each player would like to take the first step to enter the Chinese market, in order to grasp market opportunities. In recent years, the Chinese government has constantly promoted and supported the LED industry and has achieved considerably outstanding results. Since Chinese, Taiwanese, and foreign companies constantly invest in the Chinese market, a huge LED industry supply chain from the upstream, midstream, to downstream has been formed in China and the industrial cluster effect has also emerged very fast, including four areas, namely, northern area (Beijing and Dalian), Southeast area (Fujian), Pearl River Delta (PRD), and Yangtze River Delta (YRD). Among those, the highest centralization degree of the LED industry is PRD and YRD. Somebody said that if you walk from the beginning to the end of a street in China, you can assemble an LED light by yourself. Although the saying is a bit exaggerating, it is not difficult to see the concentration degree of the LED industry. Although the whole industry chain of LED illumination in China is quite complete and the comprehensive advantages of the industry is considerably obvious, as the supply chain of LED lights in China is various, severe and enormous competition has also been formed. Even the large-scaled LED chip enterprises at the high end of technology of Europe, the USA, and Japan, the manufacturers that flexibly develop with Taiwan investment, or the manufacturers in diversified development are very careful but covetous in Chinese LED lights market. However, according to the observation up till now, most of the manufactures are confident but not very sure of success, especially in vehicular led lights.